Sodium borohydride is a versatile reducing agent for use in the pharmaceutical, pulp and paper, organic chemical purification, metal recovery, textile and fuel cell industries. Sodium borohydride is an odorless, white to gray-white solid, usually appears as a microcrystalline powder. It is insoluble in ether, and soluble in glyme solvents, methanol and water, but reacts with the latter two in the absence of base. The compound is a versatile reducing agent. It is incompatible with oxidizing agents, sulfuric acid, ruthenium salt, metal salts and palladium. Sodium borohydride is an effective, very selective specialty, important hydride-reductant being used on industrial scale. It is utilized in a number of commercial applications for chemical reductions. The principle application of sodium borohydride is the manufacture of reductive bleach (sodium dithionite) to brighten magazine and newsprint grade paper. The pulp and paper industry is the largest market for sodium borohydride products. 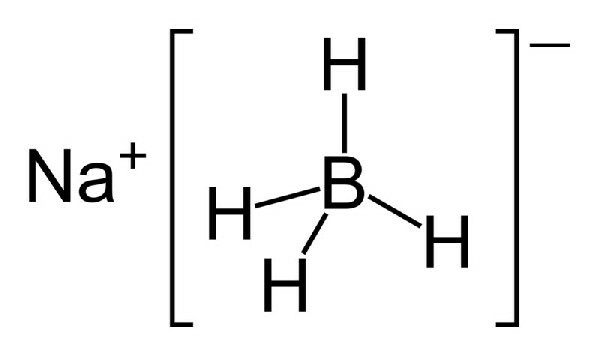 Sodium borohydride reduces aldehydes and ketones into alcohols. This is used in the production of many antibiotics including chloramphenicol, dihydrostreptomycin, and thiophenicol. Various steroids and vitamin A are prepared using sodium borohydride. The compound can also be used in-situ to produce other more aggressive reducing agents cost effectively. A vanillin reduction will produce vanillyl alcohol (mainly used as a flavouring agent) which is also found in L-dopa drugs administered to patients with Parkinson's disease. It is highly effective in reducing metal ions back to their free metal state and is an economic way to remove metals such as silver, copper, and nickel from chelated wastewater streams. Sodium borohydride, used in combination with sodium bisulfite, is recognized by leading researchers as a replacement for sodium hydrosulfite in vat dyeing, indigo dyeing, color stripping, reductive clearing, machine cleaning and many other applications where a stable, environmentally desirable reducing agent is required. Used at ppm levels, it can improve the color, odor and stability of many organic chemicals. Sodium borohydride works by reducing aldehydes, ketones, peroxides and metal impurities that can lead to the instability. - can be used in oxymercuration reactions.